Hi everyone! My name is Bonnie, and I live in Gander, Newfoundland. I am 40 years old and finally decided it was time to ride ;) My husband and I just finished our motorcycle course and brought home our bikes. I fell in love with riding but realize that I have a lot to learn. I bought a Suzuki Boulevard S40 (650cc single). It is the perfect size for me and not a "beast" in terms of power or weight. I have to admit, I am scared but excited. As soon as we took our bikes off the trailer, I started in the driveway and did the rock/roll technique to get used to the clutch's sweet spot. I will start off in the driveway, and then just down the road. We found a parking lot and are buying cones so we can practice slow turning/moving, emergency braking, changing gears (that is my biggest fear as I have never driven standard). I am so glad I found this website. Just reading other posts, makes me feel comfortable to know that I am not the only one who has fears, etc. Have a great day everyone! Oh, all tips and advice for a new rider are welcomed. Cheers! I just got my endorsement too, and am excited/nervous about practicing on a bigger bike. I will be spending some time in the parking lot too. Good Luck, and have fun! Congratulations on your new bike and welcome to the site! One of my previous bikes was an s40, and it was a blast to ride-easy to handle, low to the ground, and plenty of power when I needed it! It's great that you have someone you can ride with! Like the previous writer said, always be aware of what's going on around you and at least 10-12 seconds ahead of you....when riding a bike, we have to be "ON" all the time! Enjoy your new ride! Be Smart, Be Safe! Congratulations to you and your husband. You sound like you have a level head. The extra practice will really help you feel one with your bikes. Have a wonderful time! Very important for a new rider to know about braking. When coming to a complete stop, make sure your handle bars are straight. If you have them slightly off, you will dump in that direction. Also, I know that it is easy to get caught up in your own little world while leaening to ride, but always be aware of what is going on around you. Good luck and be safe. Hi Bonnie! 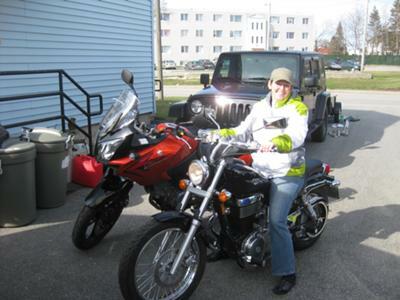 So glad to hear that you and your husband took the riding course and will be riding together. Even though I've had my license for a year now, I still consider myself a newbie and still like to do parking lot practice. One thing you might want to consider is instead of buying cones, buy some tennis balls and cut them in half. That's what I use and they work great! Another thing, if you haven't already, you might like to get the Ride Like a Pro DVD's . I have two of them - "Learn to Ride the Easy Way " and "Ride Like a Pro DVD Vol. 5 ". These have a lot of helpful information in them.